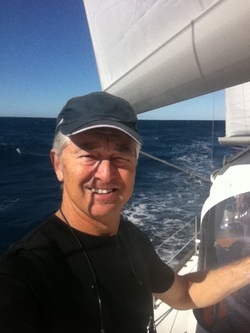 ​Mark Hunter is a Sydney based sailor having started sailing centerboard boats from an early age. Offshore racing started at age 16 with the first of 12 Sydney to Hobart races, the last completed in 2010 on Krakatoa. As well as competing numerous times in every other ocean race on the East coast of Australia, Mark has also raced extensively in the UK and Mediterranean, from 5.5 Meter yachts to Maxis. After purchasing a cruising yacht that had dirty sails, the quest to clean them has led him to forgo his city career and set up Vacuwash Australia. Your expensive sails and canvas are in excellent hands with Mark.